One should really never say "the state does this or that." It is always important to recognize who or whose interest it is that sets the machine of the state in motion and speaks through it. This book is about consensus and conflict, a central theoretical issue in the social sciences and a problem of mounting importance in all modern democracies. It deals with what governments do to bring together diverse interests and accommodate clashing values -- the Madisonian problem of containing factional war, the Durkheimian problem of overcoming threats to social integration. Plainly the 19 rich democracies discussed here as they cope with the problems of aggregating interests and resolving conflict, differ greatly in their labor relations and in the interplay of politics, markets, and the nonprofit sector. They differ in the shape of their welfare states, in their patterns of taxing and spending, in the clusters of public policies they pursue and their effectiveness in implementing policies. Most important, they differ greatly in system outputs -- what all the taxing and spending, all the policy choices mean for the wellbeing of their people. Yet, despite the obvious differences among rich democracies in social structure, culture, politics, and policy, despite their separate paths of development in the 20th century, there are several areas of convergence. My aim is to specify these differences and similarities and explore diverse national responses to common social and economic problems. I attempt to synthesize three complementary theories I have found useful in explaining convergence and divergence among the currently rich democracies. My strategy is to play convergence theory (modernization theory, theories of advanced industrialism) -- the idea that as rich democracies became richer they became more alike in social structure, culture, and politics -- against a theory of democratic corporatism and a theory of mass society, useful in explaining persistent differences. Part I, "Paths of Development of Rich Democracies," covers this ground and adds a critique of "post-industrialism," a perspective I find of limited use. Evidence for and against convergence theory is examined in chapter 1, which emphasizes nine areas: changes in family structure and function and associated political demands; the push for equality among minority groups; the rise of mass higher education; the increasing dominance of the media of mass communication and entertainment; the roles and influence of experts and intellectuals; the changing organization, schedules, and hours of work; changes in social stratification and mobility; the growth of the welfare state; and changes in political systems. These are what make modern society modern. The second theory (chapter 2) specifies types of political economy -- democratic corporatism, corporatism-without-labor, and decentralized and fragmented systems. Here the emphasis is on the structure and interaction of government, electoral systems, political parties, and major interest groups (especially labor, employers, professions, churches, farmers) and what they do to promote or diminish consensus. I generate these types by combining the cumulative power of mass-based parties, mainly Left and Catholic, historically of great significance, with national bargaining arrangements. The scheme is spelled out in Figure 2.1, with a list of policies and real welfare outputs it predicts. The third theory, "mass society," is the inverse of theories of democratic corporatism. Instead of structures conducive to consensus, this theory accents the breakdown or erosion of these structures as threats to democracy, or social order, or both. From Tocqueville to Karl Mannheim (1940), Franz Neuman (1942), Hannah Arendt (1951), and other refugees from the Nazis, these scholars tackled two problems. The first is the debilitation of culture-bearing elites (and the core values they sustain) -- lawyers who subvert the law, professors and media managers without standards, politicians with no constraint in their campaigns, business executives busy feathering their own nests. The second problem is the atrophy of such primary groups as the family and neighborhood, and the erosion of such self-governing associations as unions and churches, which result in the rising power of the mass media and the proliferation of political demagogues and extremist movements. From the 1960s to the 1980s theories of the mass society went out of fashion. In the past couple of decades, however, they have been revived in political science and sociology under different labels -- party decomposition, the erosion of civil society or civic engagement, the proliferation of protest movements, overloaded government, crises of legitimacy, and of course, discussion of the impact of the mass media and the cult of celebrity in politics and culture. Chapter 3 covers this ground, assessing evidence on social participation rates and trends and the organization and effects of the media. Throughout the book, I show that the half-dozen most fragmented and decentralized political economies are most vulnerable to mass society tendencies but that the theory cannot be generalized; it applies least well to other types of political economy. Because the welfare state is at the center of conflict about the proper role and size of government, the five chapters of Part II ("The Welfare State and Social Policy") explain the patterns of taxing and spending and social policies comprising the welfare state. It specifies the ways in which the rich democracies converge and analyzes the structural and ideological sources of differences among them. It shows how industrialization and its demographic and organizational correlates explain the universal increase and some convergence in the level of taxing and spending. It also shows that the types of political economy developed in chapter 2 account for remaining national differences in the current level of spending, sector-spending emphasis, tax structures, the size and efficiency of bureaucracies that deliver cash and services, and specific social policies (e.g. universalistic family policies vs. means-testing and a consequent welfare mess). Chapter 10 on tax-welfare backlash discusses the political effects of all these differences. Part III ("System Outputs") continues to play convergence theory against types of political economy. It is an analysis of system performance. It shows how variation in types of taxes, types of spending, and policy packages shape a large number of outcomes: economic performance, equality, poverty, job security, safety and risk, real health, the environment, the effectiveness and fairness of regulatory regimes, and political legitimacy. Some of these have conventional measures. I have developed my own where they do not. For instance, political legitimacy is measured by the vitality of political parties (chapter 11) and the capacity of government to collect taxes to pay for the demands of modern voters without triggering paralyzing protest (chapter 10). In order to show national differences in risk and safety I develop a measure of mayhem (chapter 14). Chapter 17 addresses the objection that my emphasis on the similarities and differences among national institutions as sources of system performance is outdated because of "globalization," that all-purpose cause of all our ills and opportunities. Unpacking the concept, I discuss the flow of capital and labor across national boundaries, the rise of multinational corporations, the alleged deregulation of the labor market, and the role of central banks. I conclude that of these five dimensions of globalization, only the rapidly increasing autonomy and power of central banks is a major threat to labor standards, job security, stable economic performance, and the welfare state. Any good theory of social change should address five questions. What is changing? How much? How fast? In what direction? What are the engines driving change? What is too often vague or absent in much discussion of change in modern society is answers to the first question: exactly what technologies, social structures, values and beliefs, and patterns of political behavior are changing? Just as sociology has neglected a basic task for students of group life -- a taxonomy of types of social groups that is useful for explaining the behavior of groups (Wilensky, 1961b) -- so political science needs a more effective mapping of types of interest groups, political parties, nation-states, and bureaucracies that comprise the polity. In the past 15 or 20 years, as they revive an older tradition in political science, students of comparative politics have made progress in tackling this challenging task of explaining what is changing; I hope that this book furthers that progress. Throughout I avoid vague discussion of "the state" or "society;" instead I examine the components of these grand abstractions that are relevant for our understanding of similarities or differences among the rich democracies. The entire book is an attempt to specify the institutions -- executive, legislative, judicial, military -- that comprise the state and the groups and relationships that comprise society. Although I try to answer all five of the social-change questions, my main effort is to delineate major structures that help enhance our understanding of social, economic, and political outcomes -- system performance. When I hear about the internal strains within particular countries -- "democratic corporatism in Sweden is collapsing," "American democracy is becoming polarized and paralyzed," "the Japanese model is no longer economically viable" -- I ask, "system strain, erosion, collapse of what, compared to what, in what specific policy areas?" More often than not this focus leads me to observe much continuity between generations and to greet the word "new" with skepticism. Most of the structures this book delineates are highly institutionalized, that is, publicly-recognized and sanctioned in contracts, law, and custom. They persist over successive generations, adapting to changing circumstances but retaining their essential character. In choosing the 19 countries to be studied I decided on the universe of democracies that have three million or more population (hence some degree of complexity) and are in the upper sixth of countries ranked by per capita GNP in the mid-1960s (very rich). The rich, as they say, are very different from the poor; they have more money. Average income per capita in our rich democracies is about 30 times higher than the average in the poorest countries. The size criterion excludes tiny countries (Iceland, Luxembourg) but includes New Zealand with more than 3 million. In 1966, Israel and Ireland were the poorest of the 19 rich democracies. It is a common mistake in both the press and social-science research to lump Greece, Portugal, Spain and Turkey together with these nineteen as "OECD countries" and use averages that obscure the great range of development and behavior within the category. In 1990, even after much catch-up, all but Spain were much poorer and had a much larger percentage of the labor force in agriculture than any of the 19 modern affluent democracies. For studying similarities and differences among similarly rich democracies, the 19 are the most appropriate universe. And for analysis of system performance the universe yields much more valid generalizations than any subset. For instance, if you conclude that lavish spending on the welfare state is a drag on postwar economic performance on the basis of a comparison of Italy and Denmark with Japan and Switzerland, you have selected the four deviant cases: For most of the postwar period Italy and Denmark are big spenders with poor performance, the other two are lean spenders with good performance. The subset thus obscures the central tendency, a positive correlation for all 19 rich democracies before 1974 and a mixed picture thereafter (big spenders after the two oil shocks retained an edge in growth and did no worse in controlling inflation and unemployment.) (See chapter 12.) Similarly, if you explore the impact of public-sector education and health spending per capita on real health outputs in 1980 by comparing Japan, a lean spender with excellent health, and West Germany, an above-average spender with poor health, you would conclude that spending is bad for your health. But these are the two most clearly deviant cases. Bringing all 19 rich democracies to view, we find that the opposite is true (see chapter 16, Table 16.1). So the first advantage of the universe is that we know when we encounter an exceptional case and can explore its peculiarities. A second great advantage of studying the universe of rich democracies is that we can uncover similarities among subgroups that are obscured by 2 or 3 or 4 country comparisons. In several parts of my analysis, I compare the U.S. and the UK and note many structural differences that account for some specific difference in policy or performance. Britain, unlike the U.S., has a parliamentary system with party discipline, a more centralized government, and more influential cabinet ministers and higher civil servants. In chapter 16 on the environment these differences make a difference. Similarly, modest structural differences between Canada and the U.S. help us understand why Canada got national health insurance while the U.S., despite many tries, has failed (chapter 17). But these differences turn out to be less than meets the eye. Comparing all 19 countries and considering a wider range of issues and patterns of behavior, Canada, the U.S., and the UK are much closer to one another than to the corporatist democracies of Europe or to the similar systems of Japan and France. In their structures, policies, and performance they are members of a class of the most fragmented and decentralized political economies. A third advantage of the 19-country analysis is close to my heart. I have spent half a century trying to overcome my American parochialism. Early in my teaching and research and as a guest abroad I became convinced that only through systematic comparison could I understand the United States. In my courses on modern society, comparative political economy, and comparative public policy I became a missionary for this idea -- preaching to students of American government and politics that they cannot talk about American exceptionalism without making the necessary comparisons. The last chapter of this book attempts to summarize what is truly exceptional about the U.S., what it shares with Britain and Britain abroad (Canada, Australia, New Zealand), and what it shares with all or almost all rich democracies. This exercise also provides a guide specifying which successful social and labor policies are transferable across nations despite differences in social structure, culture, and politics, and which are not. When I compare a big country, the United States, with equally rich little countries such as the Netherlands or Sweden, and claim that the U.S. can learn something from them, a few of my colleagues complain that the contrast is unfair or irrelevant, that size of population is a major determinant of the structure, culture, and politics and policies of a nation and therefore hardly anything is transferable from a little to a big country. It is true that the U.S. is by far the largest of my 19, but several others are hardly small -- Japan, France, Germany, the UK, Italy. More important, I am not impressed with mere numbers of people as a social-science variable. When scholars say big, they usually mean something else -- complex (many specialized roles) or oligarchical, or hierarchical, or heterogeneous, or centralized, or decentralized, or hard-to-govern, and more. I prefer to speak of the structures that interest me and these are only loosely related to population size. For instance, hierarchy, oligarchy, and ungovernability are often found in small as well as large systems. There are many small groups that are hierarchical (e.g. a family service agency with four levels of authority), or oligarchic (local unions in the Teamsters or in the building trades have sometimes been tiny tyrannies); and some American cities with less than a million or two are extremely hard to govern. There is also a misleading assumption not only that small is beautiful, but that a decentralized polity like that of the U.S. or Switzerland provides more channels for social and political participation than a centralized polity like that of the Netherlands or France. In cross-national perspective, however, chapter 3 shows that on average the more centralized political economies have higher rates of social-political participation than the more fragmented and decentralized democracies. Advocates of devolution further argue that local authority is closer to the people, more responsive, more informed, more efficient, more accountable. In the U.S., a glance at the record of accomplishment of the federal (i.e. central) government in coping with major social problems relative to the record of the states and localities suggests no great advantage for local authority. In fact the three most bungled problems of the U.S. -- K-12 school performance (chapter 12), welfare reform (chapter 8), criminal justice and policing (chapters 14 and 18) -- are largely under the control of states and local governments. Moreover, a partial list of the most successful large federal government programs of the recent past includes Social Security and Medicare, the GI bill, the racial integration of the armed forces, mortgage subsidies for home owners, highway development, student college loans, rural electrification, public housing for the aged, the preservation of natural resources, cleanup of air and water, the control of local vigilantes. There is no more complex problem in organizational theory than ideas about decentralization (Wilensky, 1967 pp.58-62). If we go beyond the ideologies of populist right and left about the joys of decentralization and limited central government, we find that all rich democracies have large doses of both. They all have central financing of many programs; they all necessarily rely on regional or communal units for delivery of personal social services such as job training, education, and health care. The great variations are in exactly what is centralized or decentralized in what degree -- functions, location, authority, financing, records, intelligence, loyalty -- and with what effect on equity, equality, efficiency, service, citizen response, and degrees of corruption. Throughout the book I discuss these matters, emphasizing the differences between the moderately- or highly-centralized bargaining arrangements of corporatist democracies and the more decentralized political economies. I think of small democracies as laboratories for innovative public policies from which other democracies can learn, whatever their size. Examples are the family policies of Sweden and Belgium, (chapter 7), the radical neo-liberal economic experiment of New Zealand (chapter 11), the work-oriented rehabilitation programs for the handicapped in Sweden (chapter 15), the works councils of Norway, the Netherlands, and Belgium (chapters 2 and 3). It is not at all obvious that the U.S. can learn more about the possible effects of legalizing marijuana by comparing its own distant past experience with alcohol prohibition than it could learn by comparing the contemporary experience of the Netherlands. In social-political-economic context the distance between the U.S. of the late 1920s and the U.S. of 2000 may be greater than the distance that separates contemporary Americans from the Dutch. If we wish to argue that the only countries that combine the USA's geographical reach, large population, and social heterogeneity are India, Indonesia, Brazil, and Russia, that is true enough but the only rich democracy on that list is the USA. If the remaining argument is that the U.S. is uniquely divided by race, religion, ethnicity, and linguistic cleavages, that is not true. Social cleavages based on descent are very powerful in Belgium, the Netherlands, Canada, Switzerland and Israel, and, as chapters 1 and 17 show, most of the other rich democracies, because of immigration patterns of recent decades, are converging in minority/majority conflict. Systematic comparison of the most and least socially-heterogeneous democracies at the same level of affluence can tell us much about the management of nativist protest and the fate of minority groups. This project started 30 years ago. From a base in Sweden, I began the field work in 1970. Over the next three decades I assembled a database bearing on the three theories above. I completed interviews with over 400 politicians, government health and welfare officials, experts in budgeting and taxation, and labor and employer negotiators in 15 of the 19 countries, and met informants from the other four as I participated in international conferences. I used these interviews to make sense of the quantitative results. They were an irreplaceable part of my education. I remain both amazed and deeply grateful for the hospitality and openness of the busy people who agreed to straighten me out about how things work in their country -- sometimes for many hours and repeated encounters. I hope that their briefings prevented too many foolish remarks about their countries in these pages. While I was in the field I also gathered documents covering the period 1950-1990, with some historical data going further back and some analysis extending to the late 1990s. The project was near completion in late 1991 when my home was burned down in the Berkeley-Oakland firestorm. I lost most of the manuscript, my library, files, notes, etc. It took another eight years to reconstruct what was lost and complete this book; not even that was enough to update all chapters equally well. The book draws on my 50 years of teaching and research on the shape of modern society. It taps what I consider to be two powerful interdisciplinary perspectives in social science -- political economy (the interplay of politics and markets) and political sociology (the social bases of politics). I hope that it will be useful to both scholars and practitioners. It should interest students of comparative political economy, comparative politics, public policy, political sociology, social problems, American government, political behavior, advanced industrial societies, industrial relations, and European politics. Just as I believe that affluent countries can learn from one another, I am convinced that the experience of market-oriented rich democracies can provide an important guide for less-developed nations. But unless we grasp the democratic experience in all its diversity, unless we understand the great variation in types of political economy among countries equally rich, equally democratic, the models before us will be useless if not destructive to the aspirations of newly democratizing, recently industrializing countries. When we hear that developing countries making the democratic transition must follow the liberal democratic model and quickly privatize, deregulate, open their economies, accept the bracing experience of free markets and government austerity (with correlated disruptions of society, community, and political legitimacy), are we talking about the corporatist democracies of Sweden, Norway, Finland, Austria, and Germany; the state-led achievements of Japan and France; the decentralized and fragmented democracies of the Anglo-American democracies or the peculiarities of Switzerland? Just as the economic models of newly-industrialized countries range from the successes of South Korea, Taiwan, and Spain in combining economic growth with reductions in poverty and inequality to the unstable growth and failure to reduce inequality in Mexico and pre-Cardozo Brazil, so, too, have the rich democracies followed quite different paths of development, with contrasting results for the standard-of-living and democratic participation of their citizens. All of our rich democracies have achieved a level of affluence and liberty never before seen in human history. But they vary in how they got there. By specifying the common and disparate features of rich democracies this book can underscore the likely choices facing the emerging democracies. A word about the tone of this book. It is not the mission of the social scientist to be as innocuous as possible. In the period just after World War II there was much uncritical admiration of American society in the pages of both academic and popular social science -- a celebratory literature revived in the late 1990s as Americans boasted about replacing Japan as "Number One" and advised the world to follow the path of the only great superpower. Neither is it the mission of the social scientist to trash his or her society. This was the favorite sport when the academic mood swung toward pessimism in the 1960s and 1970s. It was reflected in a declinist literature, some of it phrased in an apocalyptic tone, and all of it full of parochial complaints about the sickness and oppression of American society. These mood swings are reminiscent of the 19th-century indictment of the industrial revolution as a catastrophe and its defense as the triumph of capitalism and the machine (Wilensky and Lebeaux, 1958, pp 27-48). If rejecting both uncritical acclaim and indiscriminate social criticism makes me a "moderate" I am a dedicated moderate. This book attempts to assess performance in a thoroughly comparative way while embracing the use of such terms as dignity, security, safety, justice, and equality. In other words, it aims to combine scholarly discipline and a concern with the human condition. I have reluctantly used the phrase "democratic corporatism" to denote the bargaining arrangements among governments and major economic power blocs in several modern democracies, including Austria, Finland, Sweden, Norway, and Germany. "Corporatism" historically has a fascist connotation, which is why Margaret Thatcher used it pejoratively to complain of the policy preferences of her Labour Party opposition in Britain. The regimes of Mussolini and Peron acted out an ideology that emphasized the representation and state control of functional groups (labor, commerce, industry, agriculture, the professions) as opposed to what they attacked as decadent parliamentary systems based on elections. Obviously there is a democratic version of corporatist bargaining arrangements that provides channels for influence of functional groups but does not undermine parliamentary democracy and civil liberties. I would prefer a phrase like "negotiated economy," "consensual political economy," or "organized market economy." But because "corporatism" is firmly embedded in the social science literature I am compelled to use it. Rich Democracies reports the findings of 30 years of research. The colleagues and students at Berkeley and abroad who helped me during those years are too numerous to mention. (Those left out of this Preface may forgive me when I cite their work. Further, the long bibliography doubtless excludes sources that should be there. Aware that nine-tenths of originality is bad memory, I can honestly say that the oversights are inadvertent.) Some 65 graduate students in political science, sociology, economics, history, library science, and public policy worked closely with me on this project; many have written books of their own. I thank them all. The graduate students in my comparative political economy course provided continual critical assessment of my views and kept me on my toes. Among the project assistants whose dedication, intelligence, and extraordinary detective work in the library and on computers were indispensable are the following: In the early stages there were Tom Janoski, Richard M. Coughlin, Susan Reed Hahn, Jim Jasper, Mina Silberberg, Howard D. White, Kathleen Gerson, Timothy L. McDaniel, Lowell Turner, Anne T. Lawrence, Jeffrey Haydu, and economists Harry C. Katz, Theodore M. Crone, and Brian Main. In the later period of post-fire reconstruction, I could not have done without the dedication, high standards, and analytical skills of Frederic C. Schaffer and Karen Adelberger. Totally committed to getting the story straight, they saved me from many an error. Equally important was the assistance of John M. Talbot in all quantitative analysis. Drowning in regression equations, he periodically surfaced with clarity and economy. Other excellent Berkeley students who served in the 1990s for shorter periods include Daniel Ziblatt, Susan B. Martin, John W. Cioffi, Martin Gillens, Marc Howard, Susan Siena, Linus Masouredis, and Brenda McLaughlin. Anne Clunan and Diahanna Lynch made order out of chaos in the production of the final manuscrispt. Librarian Terry Dean graciously tracked down many a fugitive source. Four Berkeley research institutes were sources of aid and comfort: throughout most of the life of the project, the Institute of Industrial Relations (and especially two of its Directors, Lloyd Ulman and George Strauss); during the initial fieldwork, the Institute of International Studies (and its then Director, Carl Rosberg); in the 1990s, the Institute of Governmental Studies (and its longtime Director, Nelson Polsby, and more recently Bruce Cain); and the Center for German and European Studies (and its Director, Gerald D. Feldman). Successive small grants from the University of California, Berkeley Committee on Research also helped. Among the many Berkeley colleagues who not only sustained my morale and kept me alert, but also gave me crucial feedback on various sections of the manuscript, I am especially indebted to Nelson W. Polsby, Ray Wolfinger, Lloyd Ulman, Neil Smelser, and Martin Trow. Bent Hansen helped in my comparison of various measures of economic performance; by redoing some of the analysis his way he assured me that my minor mistakes made no difference. Jesse Choper provided a critical assessment of my account of law, lawyers, and economic performance in chapter 12 when we shared the beauties of Bellagio at the Rockefeller Center in October 1992. Other colleagues here and abroad who kindly offered their comments are acknowledged in the relevant sections of the book. None of these tough-minded scholars will be quite satisfied with the finished product. Sins of factual error, taste, or bias are therefore mine. Generous support at various times in the 1970s and 1980s came from the National Science Foundation, the German Marshall Fund, and the Ford Foundation (specific grants and years are specified in earlier publications.) I am still drawing on the intellectual capital built up during two stimulating years at the Center for Advanced Study in the Behavioral Sciences, 1956-57 and 1962-63; they were intellectual feasts. Finally, my gratitude and love goes to Mary Sharman, who tolerated my obsession with this project. She shared all of its ups and downs with the same strength and rhythmic flow of her Chopin at the piano. 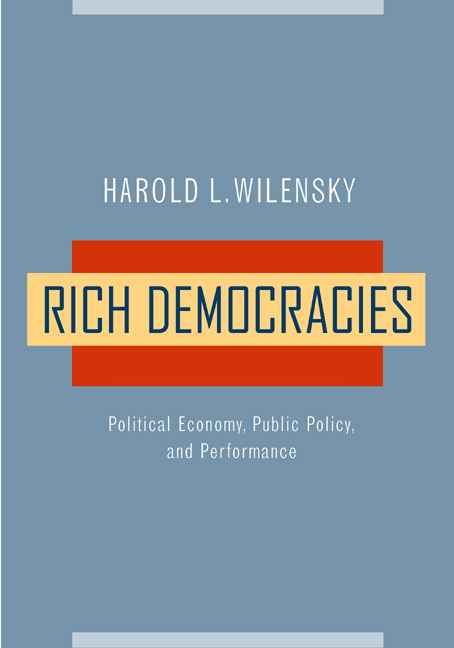 In this landmark work, the culmination of 30 years of systematic, comprehensive comparison of 19 rich democracies, Wilensky answers two basic questions: (1) What is distinctly modern about modern societies--in what ways are they becoming alike? (2) How do variations in types of political economy shape system performance? He specifies similarities and differences in the structure and interplay of government, political parties, the mass media, industry, labor, professions, agriculture, churches, and voluntary associations. He then demonstrates how differences in bargaining arrangements among these groups lead to contrasting policy profiles and patterns of taxing and spending, which in turn explain a large number of outcomes: economic performance, political legitimacy, equality, job security, safety and risk, real health, the reduction of poverty and environmental threats, and the effectiveness and fairness of regulatory regimes. Drawing on quantitative data and case studies covering the last 50 years and more than 400 interviews he conducted with top decision-makers and advisors, Wilensky provides a richly detailed account of the common social, economic, and labor problems modern governments confront and their contrasting styles of conflict resolution. The result is new light on the likely paths of development of rich democracies as they become richer. Assessing alternative theories, Wilensky offers a powerful critique of such images of modern society as "post-industrial" or "high-tech," "the information age" or the alleged dominance of "globalization." Because he systematically compares all of the rich democracies with at least three million population, Wilensky can specify what is truly exceptional about the United States, what it shares with Britain and Britain abroad (Canada, Australia, New Zealand) and what it shares with all or almost all of the West European democracies, Israel, and Japan. He gives careful attention to which successful social and labor policies are transferable across nations and which are not. Rich Democracies will interest both scholars and practitioners. It combines the perspectives of political economy (the interplay of markets and politics) and political sociology (the social bases of politics). It will be especially useful in courses on comparative political economy, comparative politics, European politics, public policy, political sociology, the welfare state, American government, advanced industrial societies, and industrial relations. Harold L. Wilensky is Professor Emeritus of Political Science, University of California at Berkeley. He is a fellow of the American Academy of Arts and Sciences and the author or co-author of twelve previous books, including Industrial Society and Social Welfare (1958, 1965); Organizational Intelligence: Knowledge and Policy in Government and Industry (1967); The Welfare State and Equality (California, 1975); Democratic Corporatism and Policy Linkages (1987); and Intellectuals in Labor Unions (1956). Before joining the University of California in 1963 he taught at the University of Michigan and the University of Chicago, where he received his Ph.D. in sociology. CHAPTER 17 Globalization: Does It Subvert Labor Standards, the Welfare State, and Job Security?